I think many people have the wrong idea though: it’s not just sushi, sashimi and ramen. Yes, those are all delicious, but there’s so much more: light tempura, meaty tonkatsu, chicken karaage, udon, women, nimono, mochi, and one of my favourites: okonomiyaki. Theres not really anything I can compare it to, than a savoury pancake. It’s not like a crepe, where filling are inside, but more of a thick pancake batter with vegetables mixed in. You can really make it your own, whether you want meat, seafood, vegetables, mochi or even cheese! for this recipe, I have made two types: one that I’d suitable for vegetarians (and vegans, if you sub the egg for a flax/ chia egg) and one with meat in it. 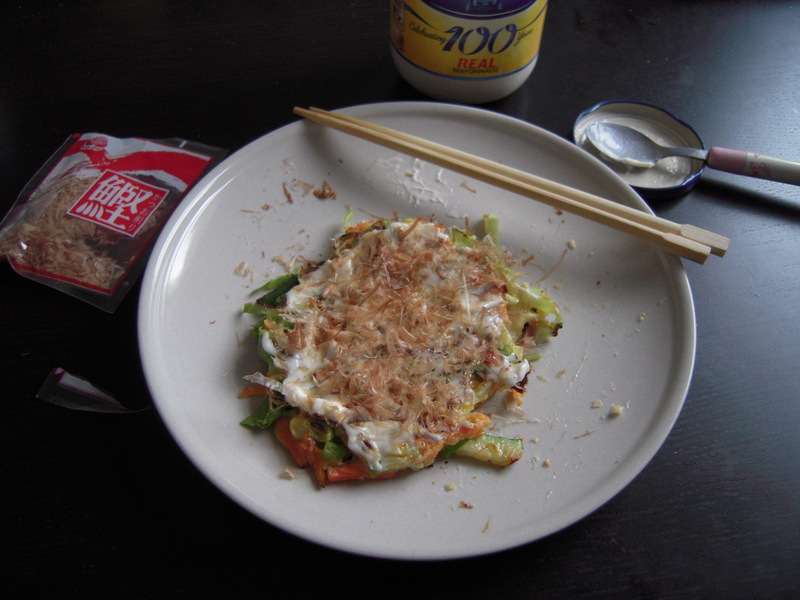 However, there is no need to follow the recipe exactly, as okonomiyaki means ‘as you like it’. I think a really fun idea would be to have an okonomiyaki party! Just make the batter and refridgerate it and when guests come, get them to add ingredients they want and cook it! Mix the flour and water together and leave to rest in the fridge for an hour or so until use. 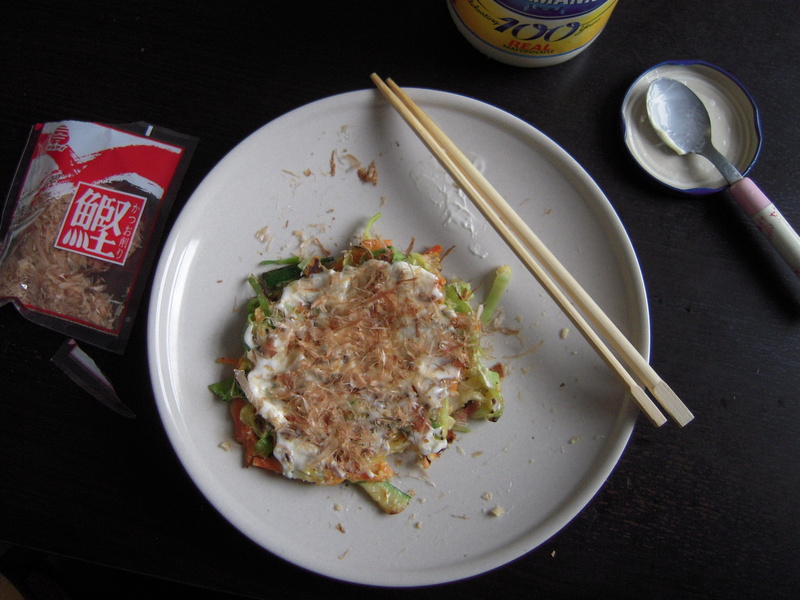 When you are going to make the okonomiyaki, add the egg. Mix in the cabbage, scallions and any other ingredients you may be using. Heat a pan and add oil liberally, so it wont stick. Add a quarter of the mixture (or less if you want smaller ones) into the pan and cook for a few minutes and just before flipping, add some bonito flakes to the wet side. Flip and when cooked, serve immediately with mayo and brown sauce.